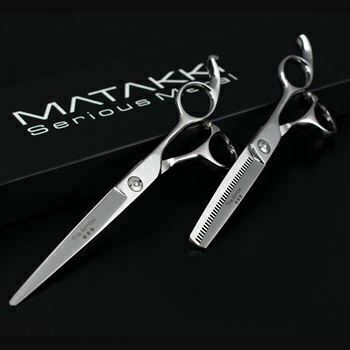 Created from Japanese VG-10 steel, the Vintage has been a strong seller of Matakki since 2013! Beautiful ornate flower design carved into each handle makes the Vintage an extremely desirable scissor. Light-weight, beautifully balanced and super sharp convex cutting edges makes the Vintage a delight to work with as used by many top hair stylists all over the World. Delicate ornate flower design carved into each handle with the addition of a gorgeous emerald green gem tension screw. Light-weight, beautifully balanced and super sharp convex cutting edges makes the Vintage Ruby a delight to work with! 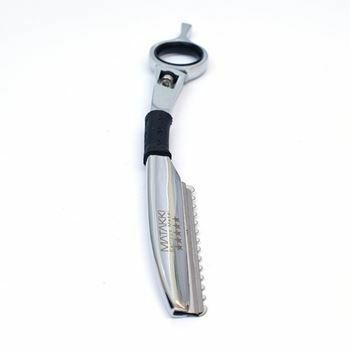 The Matakki Encho crane design stylist scissor is an excellent choice for people who suffer with neck and shoulder pain. Perfectly balanced scissors with a cutting action so smooth you’ll wonder if you have scissors in your hand. Why not pay monthly with our interest free finance options! The Aku is engineered with a crane 3D offset handle to sculpt your hand perfectly and includes a sword style blade profile which makes this model perfect for powerful wet and dry cutting. Perfectly balanced and super smooth, The Aku is an amazing professional tool that senior and advanced level hair stylist will love working with. Hand crafted from Japanese 440C stainless steel ensures longevity and a convex edge that remains sharper for longer.